Harsha my friend , the very first storyboard speaks your comic sense. I missed this post of yours only because I have not checked Indiblogger since yesterday 2:30 pm 🙁 else … anyways … it was all the more exciting to get it as a surprise !! Nicely done again with your sketch. our nation is never prepared for calamities..life has no price here .. for commoners. I pray Almighty bring things back in place with no further casualties. helpless we stand when Mother Nature is furious … all the more because we are Indians.. where administration reacts only AFTER mishaps , be natural or manmade ! “barbadiyon ka sogh manaanaa fuzool tha…barbadiyon ka jashn manaataa chala gaya…”….. I mean, i have heard that song before and only recently I understood the depth of it .. specifically the lines I mentioned. I’d again repeat your doodles are acquiring a class of their own. Reminded of the veteran R.K. Laxman time and again. In this instance, your doodle has effectively brought forth the grimness of the situation and a smile too without diluting the effect! kintoo.. RK Laxman !! ? ?faint hoye jabo .. sotti !! Above all, there is God…Really…? I feel so Jeet !! Trust Him ! oops !! Holy Lord !! a close encounter with the only absolute -Death ?Would like to know what happened exactly-Why not as a post Pankti ? Its a horrible experience forsure to be compelled to surrender before the Might Of Death !! 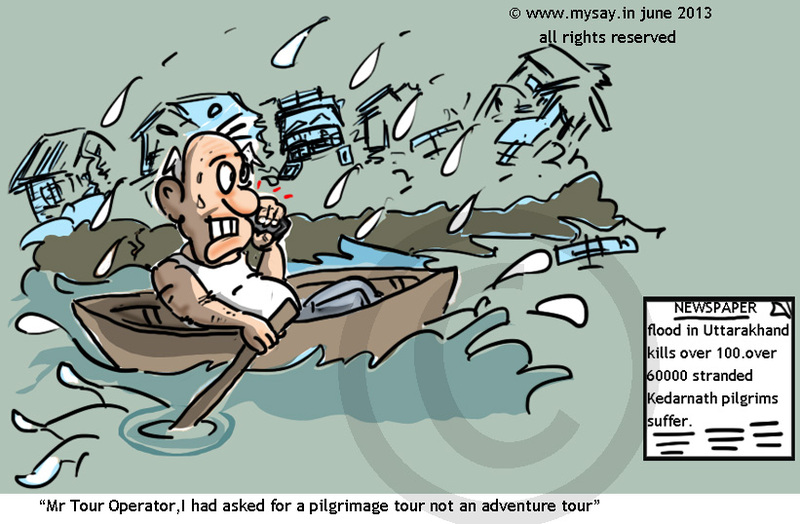 I pray for all the pilgrims stuck there and yet to be rescued .. Amen !! hahaha !! u bugged Him so much ?? hehehe !! just kidding !! Even i have had a horrible experience while returning from Srisailam , one of the 12 jyotirlings of Lord Shiva!So much bad that I felt why did I opt to go ?? But if you got to go to Srisailam .. better be safe than sorry !! It’s really sad to see people in the affected areas. I just wish they get adequate aid. Hope we would be able to take care of any such calamities beforehand!